The other day actors Michael Caine and Morgan Freeman conducted a live interview with Bill Wixey and Kaci Aitchison from Q13 Fox News right here in Seattle. The interview centered around their upcoming film, Now You See Me. But as you now see here in this abridged clip, Mr. Freeman was having a bit of a struggle staying awake while Mr. Caine spoke. I like in particular how he arouses briefly, nods his head slowly, as if he’s been fully attentive the entire time, and drifts back off. Here is an online article, which includes Bill Wixey’s post-interview reaction and also the full video interview with Caine and Freeman. It’s worth watching the entire interview here: there is much more sleep time than what is seen in the brief clip above. Now, to be fair about this, this soporific faux pas is likely not Freeman’s “fault,” and is probably not due to boredom, as at least one journalist has suggested. It appears that Caine and Freeman were interviewed from a studio in New York. I’m guessing Freeman had flown from Los Angeles to New York shortly prior to the interview, and if this was the case he was probably recovering from jet lag. Remember, there’s a 3-hour time difference between the west coast and the east coast. Sleepwise, it’s particularly tough to go from the west coast to the east coast, because upon arrival your brain is essentially asked suddenly to go to bed earlier and awaken earlier than usual, setting you up for insomnia and sleep deprivation. I know this from experience: I fell asleep at my table and virtually fell out of my chair once during a loud, boisterous classic rock awards banquet shortly upon arriving in London several years ago. Additionally, in general, the older we get, the less tolerant our bodies become to insomnia, sleep deprivation, and shifts in our usual sleep scheduling. So I definitely empathize with our nearly 76 year-old Mr. Freeman, who was sitting in a comfortable, quiet environment during the interview, his uncooperative body clock begging for a snooze. One final comment. I’m often asked if you fall asleep during the day just because you’re bored. The answer is no. However, if you are prone to becoming excessively sleepy during the day (due to sleep deprivation, an untreated sleep disorder, or the like), then your sleepy tendencies will be more likely to express themselves in the form of falling asleep by accident when you are sedentary as compared to when you’re active. When you’re bored you’re usually sedentary, so in that setting you’re therefore more likely to fall asleep. This is an important distinction to make; many people don’t get evaluated for their sleep disorders because they believe that falling asleep frequently during the day is normal because they’re bored. Have a good, wakeful day, everyone! I find this work completely fascinating. The children depicted here all have stories, stories told on their faces and by their sleeping environments. The universality of sleep comes through in these photos: the basic need for a bed or at least a bed equivalent; a place of relative quiet and privacy; a personal space in which one’s personality and circumstances may be expressed. However, as you can see from the photos, that’s where the similarities end. The obvious contrasts between sleeping quarters from different corners of the world are equally engaging. My understanding is that Mollison was born in Kenya and raised in England; perhaps he may have had personal experiences to mirror such contrasts, at least to some degree. One could come up with all sorts of political and social commentary by viewing these photographs, I suppose, but for me I am drawn in particular to the themes of the ubiquitous need for sleep and the necessity of getting sleep where and how you can, no matter who you are, where you are, or where you’re from. I encourage you to take a look. Something to consider today. Cheers, everyone! It’s 1 a.m. You debated all day about how good of an idea it would be to drive all night to get to West Palm Beach, but the advantages of taking the chance won out: you’d beat the traffic, and the time you’d save by getting there by early morning would make the challenge of pulling an all-nighter worth it. So now you’re on a highway, quite alone and in pitch darkness. The road is straight and monotonous. You start to count the mile markers out of boredom. After an hour and a half, things start to look blurry. A hazy veil starts to descend slowly over your eyes and upon your brain. You realize what is happening, and you shake your head violently to become more alert. You roll down the windows, but the Florida late spring night air bathes your car interior with humid heat. You crank your car stereo up to eleven. Passing sign says, “rest stop, 40 miles.” You push on, propelled by your determination and time. You sing loudly to the Def Leppard song playing on the only rock and roll station you can find on this desolate stretch of road. Soon, however, without realizing it, you gradually become silent. You feel yourself giving in despite yourself. You suddenly find yourself parked in the rest stop, but for the life of you you cannot recall how you got there. Many of us (myself included) have been in this situation before. You would not believe the stories I hear from some of my patients, who have fallen asleep behind the wheel of their 18-wheelers, behind the wheel of their school buses, or at the controls of their motorcycles on the freeway. It should frighten you to know that many many thousands of people in the United States drive drowsy, including right next to you, every day. Here are some sobering statistics. According to the National Highway Traffic Safety Administration, over 100,000 police-reported motor vehicle accidents occur in the United States each year due to drowsiness; this number is likely an underestimation of the total number of fall-asleep car crashes in this country, because undoubtedly there are many accidents (particularly single-car crashes) that are never reported. Due to these 100,000 crashes, roughly 40,000 injuries occur every year, and 1,550 people die per year. According to an NHTSA-sponsored telephone survey report entitled “National Survey of Distracted and Drowsy Driving Attitudes and Behaviors,” 37% of drivers polled have nodded off for at least a moment or fallen asleep while driving at least once in their lives while driving; 8% have fallen asleep driving within the past six months. Falling asleep behind the wheel appears most common among drivers age 21-29 and males, and least common among drivers over age 64 and females. 71% of 18-29 year-olds have reported being drowsy while driving. 50% of 30-64 year-olds have reported being drowsy while driving. It makes sense that people are found to be most likely to fall asleep driving in the early morning hours, particularly 2-7 a.m. People are also particularly at risk after having driven for long periods of time (3-4 hours or more) or if they are sleep-deprived (i.e., under 6 hours of sleep) the night prior to driving. Paradoxically, the faster people drive, the statistically more likely they will become involved in a fall-asleep car crash, presumably because unlike in-city driving with all its starts and stops, highway driving is continuous, sedentary, and monotonous, making one predisposed to drowsiness prone to head-bobbing and dozing at exactly the time in which being alert is the most necessary. You’ve probably heard that drowsy driving is every bit as dangerous as drunk driving. I would go one step further and say that drowsy driving is in some ways more dangerous than drunk driving, simply because there are just so many drowsy drivers out there all the time, particularly at night, but also during the day. 1. Get proper amounts of sleep each night, and particularly the night before a trip. 2. Avoid driving, particularly long distances, late at night if you can possibly help it. 3. If you HAVE to drive late at night, bring a driving buddy. Consider coffee or a caffeine-containing energy drink. Some rest stops have free coffee to prevent drowsy driving, but don’t count on coffee being available to you in this way. Be prepared. 4. Take a break frequently, even if you’re not drowsy. Find rest stops, pull over, get some fresh air, walk about. 5. Pull over and take a nap if you have to, and lock your car doors. Better to show up late than to show up dead. 6. NEVER, EVER operate a vehicle or machinery if you’re drowsy or fatigued. Period. I readily admit that I don’t take as many vacations as I should these days. I can count the number of days off I took last year on my two hands. Like many of us, I find it difficult to leave my work: what will the place do without me, after all, and how will it possibly survive? Taking a little time away now and then is crucial for me and my family, and the older I get, the more so it becomes. We love to travel, but more critically, there is something vitally important about getting gone for a while: I need a good dose of new perspective from time to time, a reminder of the reality that exists beyond the walls of my clinic. So my wife and I decided to bite the bullet and book a trip to one of our favorite relaxation sites, Hawaii. Our whole family needed a break, we reasoned, from hard work and this dreary Seattle weather, so off we went last week to Waikiki. During Hawaii’s rainy season, of course. 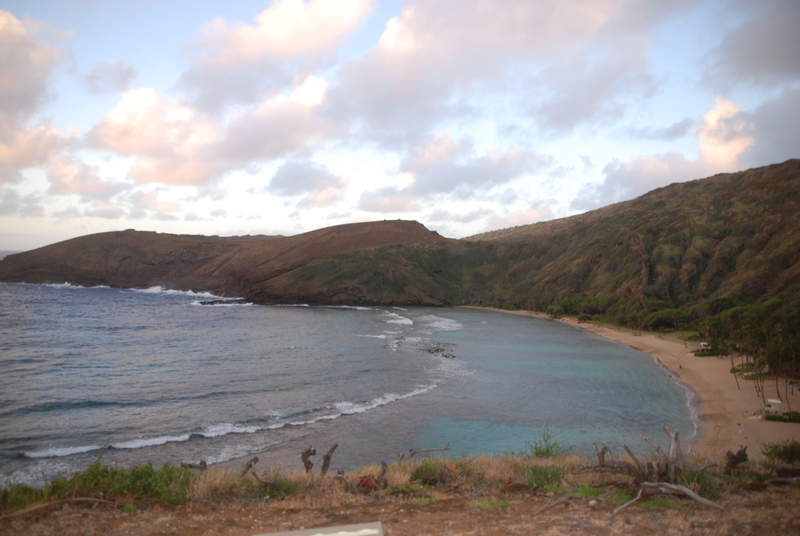 One of my favorite spots on Oahu is the acclaimed Hanauma Bay, not far from Waikiki and Diamond Head on the southeast corner of the island. A remnant of an ancient volcano, its crescent-shaped crater is fed sea water continuously from its distal outlet, but what makes the bay truly remarkable are the huge, bountiful, finger-like shallow coral reef complexes and the multitudes of colorful sea life that take up residence there, meandering and darting through the coral structures in a beautiful, primal dance. 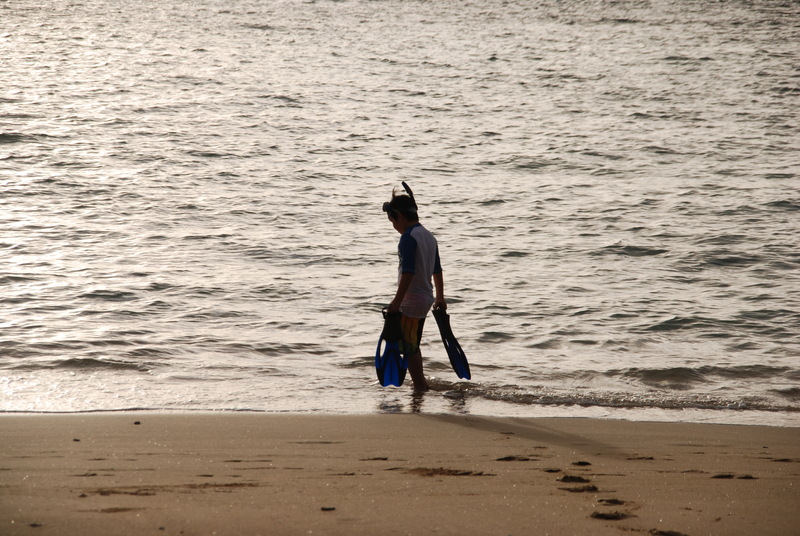 I’ve been to the bay several times in my younger years, and now taking my children to float above its reefs allowed me to relive that initial thrill of becoming one with thousands of bright butterfly fish, mammoth parrotfish, majestic honu (green sea turtles), delicate silver goatfish (traveling in huge schools), various surgeonfish, and countless other marine species. Unfortunately the place is not a secret, and even in the off-season the shore sands of Hanauma Bay fill with legions of international tourists because the snorkeling is so great, but if you go early enough in the morning the beach is quiet and desolate, and for a few precious hours you and your family feel like you are the very last people on earth. Our first swim out was memorable for more than just the fish. The tide was high and the current unusually strong. It was difficult to progress despite my long fins and my experience in open-water diving; I could feel my muscles tensing as I strained to lead the boys to deeper water. Then I remembered what I constantly have to remind myself of each time I slip into the ocean: the water is bigger than me, and it’ll do what it’s going to do, whether I’m in it or not; better to accept it for what it is and go with its flow than to fight it and waste energy. My boys were experiencing the same and worse, splashing and fighting the water’s choppy shoreward push. So I made us stop and stand for a few minutes, waiting for the occasional brief calm in the water for our opportunity to go out further. In this way we eventually found ourselves swimming with thousands of fish in deeper water. I encouraged my boys to observe the fish’s movements in relationship to the waves. We floated quietly at the surface, observing the creatures below us. The fish, of course, were just as subject to the slow rhythms of tidal surges as we were. We discerned a pattern as we watched. As the tide approached, they appeared to relax their bodies and become more bendable, like colorful oval pieces of soft rubber. A second later, an invisible plume of water sent them tumbling, rapidly but gracefully, sometimes in unison, sometimes in all different directions and angles, but never onto or against the abrasive surface of the coral. Then, the next moment, we felt ourselves pushed forcefully by that same invisible force. Our reactive inclination was to resist, to push back to stay in place. But the fish teeming beneath us taught us something. All that struggle against our surroundings, it was utterly futile. So we stopped struggling and forced ourselves to relax like the fish. Flowing along wherever the tide led us, we quickly found ourselves covering more ground, encountering more fish, and enjoying ourselves more, without consuming all our energy fighting the current. You’re asking, what does this all have to do with sleep? Well, it often is wasted energy fighting what is natural, what is inevitable, what is bigger than you. This is an important recurring theme in my management of insomnia (as well as my blog entries), to reverse that conditioned inclination to resist, to fight, to try hard to achieve sleep, when sleep is a natural, required biological function that need not be pushed into being. Seeking ways of allowing it to come upon you naturally generally works better than trying to force it into you. On a broader level, though, the perpetual lesson for me is that I am constantly surrounded by forces I’m unable to control. The changes that are happening in health care, for example–administratively, financially, and otherwise–and the even crazier changes yet to come, I am powerless to alter or prevent them. So again, to me vacations are great for gaining and regaining perspective. Better to relax and keep yourself limber and flexible in preparation for the inevitable next push of the tide; you may not end up in the place you originally intended, but you’re less likely to get hurt and you might even enjoy the ride. Hmm . . . perhaps I need to start planning my next vacation soon. I could use all the perspective I can get. 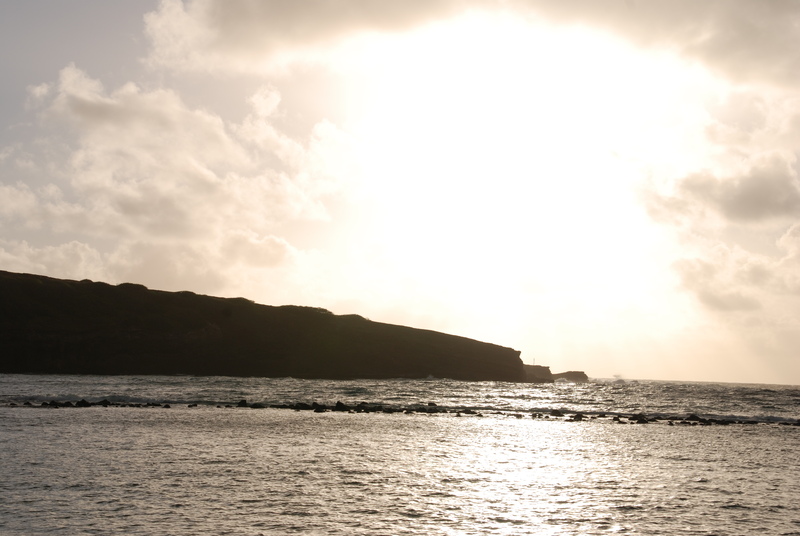 I’m back on the mainland now, so there will be more writing to come shortly. To my readers, mahalo!